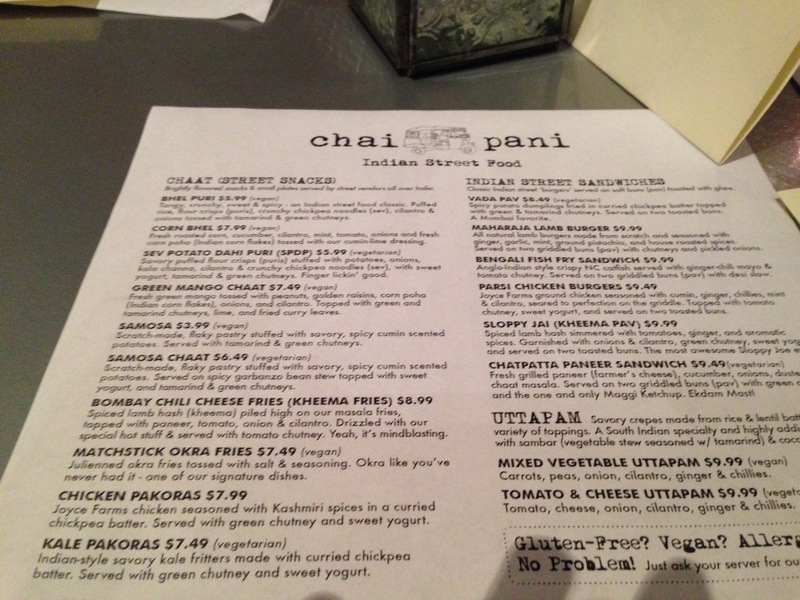 If you enjoy Indian cuisine and live or travel near Atlanta, Georgia or Asheville, North Carolina, you must sample the street food tour of India that is Chai Pani. From pakora to Pani puri to thali that will satisfy the heartiest appetites, your palate might never want to leave! (North) Indian restaurants are as plentiful in major cities around the world as is the Indian diaspora, but Indian street food is a bit more elusive for most of us not of Indian descent. Small snacks, known as chaat, are often foreign to the casual Indian restaurant goer in the USA. Intense explosions of sweet, savory, and crunchy flavors – often with a fried component – are the hallmark of chaat. Each state and region within India creates its own style of favorite chaat. And so does Chai Pani. Husband and wife team Meherwan and Molly Irani created Chai Pani (literally “tea” and “water”) to bring the diverse flavors enjoyed throughout India as both snacks (street food), meals, and beverages to the American southeast. Launching in Molly’s hometown of Asheville, NC, their restaurant was such a hit that they expanded to Decatur, Georgia, a suburb of Atlanta best known as home to Emory University. I can’t rave enough about Chai Pani. Brought by relatives for a “fun” (their endorsement) Friday night dinner outing, I found myself a little skeptical when I saw what looked to be a diverse, yet very educated, bourgeoise crowd and mostly Caucasian wait staff. I know, I know, that’s bias, right? But please tell me that you have never once done the same. We all tend to crave authenticity of cuisine – and superficial indicators of it don’t hurt. But then again, this is the Culinary Diplomat. Who really is to judge authenticity? What does it even mean? Are we all really that comfortable with the culture shock of truly “authentic” cuisine (here, I mean food that natives/expats recognize and identify as our home cuisine)? * Truly, aren’t all national cuisines continuing an evolution that started millennia ago, influenced by both travels abroad and outsiders? Chai Pani seems to appreciate that point. Chai Pani believes in the “evolution and innovation” of food; serving dishes that evoke both “traditional” and 21st century influences? Chai Pani’s ingredients – with responsible sourcing and high quality – are geared towards the globalized foodie seeking new flavor adventures. Romantic, intimate dining it is not. Like the traveler’s experience of India, the restaurant’s open, food hall-esque dining rooms buzz with the excited chatter of its many group diners. I hear that it is always busy. While it was bustling when we arrived, we were fortunate to be seated immediately, but unfortunate to miss out on the nightly special chaat sold at the bar for those hungry patrons waiting on their table. As we left, a long line stretched hungrily awaiting each turn to purchase Pani puri for a very nominal price. If you’ve never tried Pani puri, you must at once. Small, thin, deep fried dough shells are filled with a mixture of potatoes, chickpeas (garbanzo beans), onions, and whatever veggies, starches, or garnishes the cook chooses, and splashed with a slightly diluted chutney (the puri, or water). When done right, they are perfect little packages of contradictions: savory, salty, herbed, and even sweet; a crunchy exterior surrounding a very soft interior. 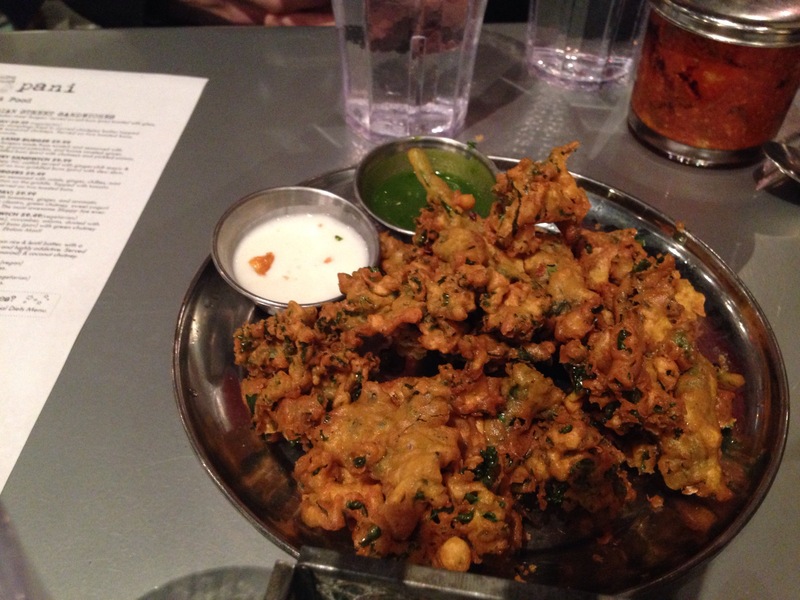 The meal I actually ate that night started with kale pakora. If you are not familiar with pakora, think of it as its cousin, tempura, but battered with chickpea flour. One might consider battered and deep fried kale to be blasphemy both to whole food purists and actual Indians, but Pani Puri notes that kale does grow in southern India, so why is the idea so far-fetched? Though I generally am not a huge fan of deep fried food, one bite convinced me that kale pakora might be the best idea ever. Or at least of the day. I later described it to a friend as “kale chips on steroids”, and it seems an apt description as any. It was served with both traditional green chutney and a tangy yogurt dip (not raita). Other appetizers ranged from bhel puri to samosas to Bombay chili cheese (Kheema) and okra fries. My family convinced me to order a full thali so that I could experience the restaurant fully. A thali is a traditional meal that consists of a variety of small dishes and bites. Think of it as the Indian equivalent of a bento box. 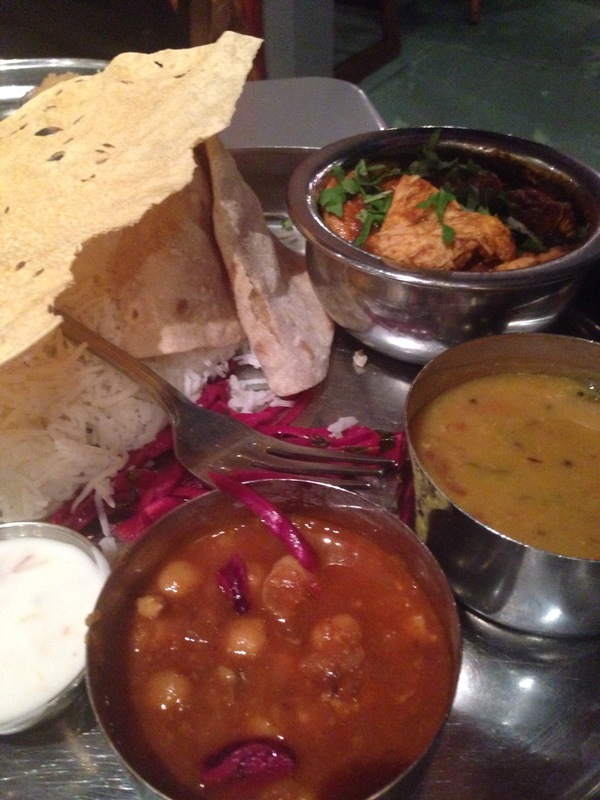 At Chai Pani, it is equally as beautifully presented as any bento. Their thalis consist of a main dish, choices of which vary daily and an accompanying, complementing side dish; along with dal (stewed lentils), various starches – crispy, salty papadum, wheat roti (tortilla-like flatbread), and basmati rice, condiments, and a small dessert. On this night, one meat (chicken), one vegetarian (paneer, or cheese), and one vegan curry were offered. With only three options, I somehow managed to have a difficult time deciding. I finally picked the Andhra vegetable kurma. Cauliflower, peas, and carrots bathe in a velvety, smooth tomato curry made rich with cashew and coconut. It was a bit spicier than usual, I was told, but I thought it had a perfect level of heat. My sister ordered the Arangaon chicken curry, which prominently features cinnamon but is decidedly more savory than sweet with a hint of bitterness. Her husband went for a more “evolved” fusion choice, ordering the lamb burgers from their street sandwich menu, which are like slightly oversized, spiced sliders. Every bite was delicious. 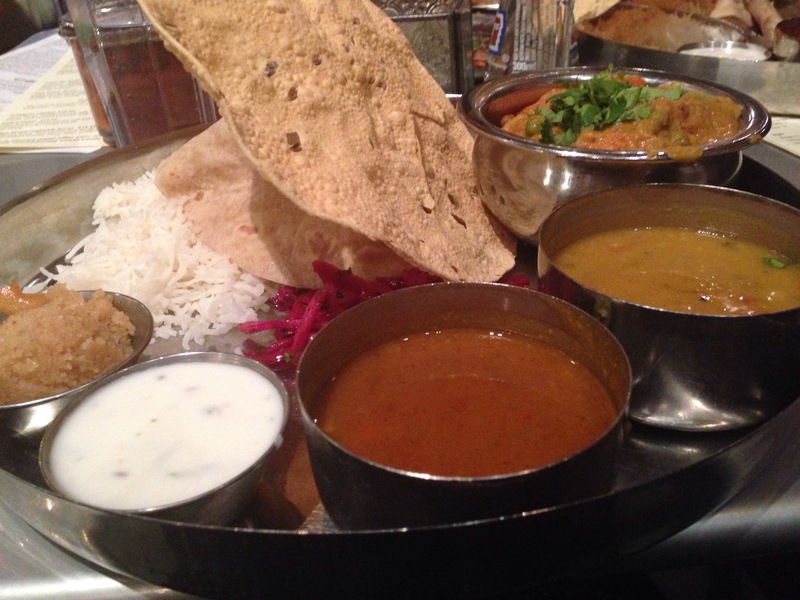 While my thali leaned more to the traditional side than many of their menu items, I would love to make a return trip to try whatever shows up on that oh so difficult to choose, eclectic all-India menu. So the next time you’re in Atlanta or Asheville and seek a food adventure, I recommend making a night of Chai Puri. If you’re in Decatur, follow up the spice with some Butter and Cream, my favorite ice creamery. *I dearly love Indian food and have traveled around India myself, but even I don’t find “authentic” Indian street snacks incredibly appealing. Case in point: I also visited an Atlanta suburban eatery called Thali. A vegetarian restaurant specializing in chaat and located within an all-Indian strip mall that clearly caters to those in the Indian expat community, I found its chaat to be excessively starchy, with few homemade ingredients. As in mass quantities of deep fried dough with fried chickpea noodl, etc. perhaps tasty as a snack but overwhelming as a meal -for my Healthy Diplomat’s tastebuds. These pictures are seducing me! !